A near 60 year old male called 911 for increasingly severe fever and SOB. A prehospital ECG was recorded (not shown and not seen by me) which was worrisome for STEMI. He presented very tachycardic with a very high fever. There is profound ST Elevation across all precordial leads, as well as I and aVL. 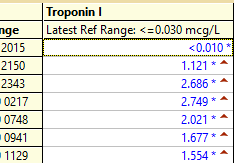 QTc was 374, and the formula value was quite high, consistent with LAD occlusion. This looks like an anterior STEMI, but it is complicated by tachycardia (which can greatly elevate ST segments) and by the presentation which is of fever and sepsis. If a patient presents with chest pain and a normal heart rate, or with shockable cardiac arrest, then ischemic appearing ST elevation is STEMI until proven otherwise. But when the clinical presentation is sepsis, one must entertain the possibility that the ST elevation is due to demand ischemia, or some other process, and exacerbated by tachycardia. It is prudent to treat the other conditions, get the heart rate controlled, and repeat the ECG. Although the quality is suboptimal, it appears to me to show a hyperdynamic heart and possibly and apical wall motion abnormality. Any value greater than 18.2 should be assumed to be LAD occlusion until proven otherwise. Cardiology was consulted and they did not think there was an indication for emergent cath lab activation. The estimated left ventricular ejection fraction is 50%. The estimated pulmonary artery systolic pressure is 37 mmHg + RA pressure. Normal estimated left ventricular ejection fraction lower limits of normal. The resident asked me what I thought about this case after the fact but before the angiogram. I said I think there is a fixed stenosis in the LAD and the tachycardia and stress caused a type 2 STEMI. In this abstract from 2011, we found that 4%(4 of 99) type 2 MI and 38% of type 1 MI had ST Elevation. It showed no culprit and no coronary disease, but did show a myocardial bridge in the mid LAD. Myocardial bridging is when the coronary artery, usually the LAD, dives into the myocardium. "Normally, only 15% of coronary blood flow occurs during systole, and because myocardial bridging is a systolic event on angiography, its clinical significance and relevance have been questioned. The presence of tachycardia could unmask the ischaemic effect of a myocardial bridge by shortening the diastolic period and increasing the importance of systolic blood flow. Also, tachycardia may worsen ischaemia because of a decrease in diastolic filling time and in coronary flow reserve (a measure of the ability to augment coronary blood flow under stress). According to one hypothesis, systolic kinking of the blood vessel may cause trauma to the intima and damage to the endothelium, especially at high heart rates. This, in turn, could produce platelet aggregation and vasospasm and result in an acute coronary syndrome." This was a type 2 LAD STEMI. In other words, there was transmural ischemia during the tachycardia due to both demand (high heart rate) and to the effect of myocardial bridging, which would mimic near occlusion. Then when the heart rate comes down, demand is decreased and full perfusion is restored, just like it is in Wellens’ syndrome. So the ECG findings are the same as if the patient had an anterior STEMI with reperfusion. Thus, there is a wall motion abnormality in the distribution of the LAD (not global apical dyskinesis, as in takostubo). This wall motion abnormality will almost certainly resolved with time (myocardial stunning). Takotsubo stress cardiomyopathy is also a possibility, but the echo did not have the typical global apical hypokinesis, and the ECG, especially the reperfusion ECG, is more consistent with LAD ischemia. There are 3 aspects about this case that I love: i) It reminds us about the clinically (but not anatomically) uncommon, but very important entity of Myocardial Bridging; ii) It illustrates the concept of a Type 2 MI, with an example in which there was marked diffuse ST segment elevation; and, iii) It illustrates the influence that tachycardia may have on the amount of ST elevation that will be seen. Autopsy studies suggest that Myocardial Bridging may be found in as many as 1/3 of adults. But because most cases result in little or no restriction of coronary flow — the condition usually goes unrecognized, unless there is occasion to perform cardiac catheterization. Emergency providers will encounter this condition — so it is good think about it! — CLICK HERE — for my Review on Myocardial Bridging in discussion of another case. It is important to remember that not every acute MI with ST elevation is the result of acute coronary occlusion. With a Type 2 MI, despite no acute coronary atherothrombosis — there will be positive Troponin with either new cardiac chest pain — and/or new ischemic ST-T wave ECG changes — and/or new Q waves on ECG — and/or objective demonstration of new wall motion abnormality. The mechanism responsible for Type 2 MIs is oxygen supply & demand imbalance — which may result from a variety of causes including sustained tachycardia, severe bradycardia, coronary spasm, severe anemia, respiratory failure, hypotension/shock — all of which may be exacerbated by significant underlying coronary disease that had been compensated prior to the appearance of the precipitating cause. — CLICK HERE — for the ESC/ACC/AHA/WHF 2018 Consensus Document on the 4th Universal Definition of MI, in which these concepts are discussed and illustrated. Finally — I selected the 1st and 3rd ECGs done in this case to illustrate the difficulty assessing acute ST segment elevation in association with marked tachycardia (Figure-1). 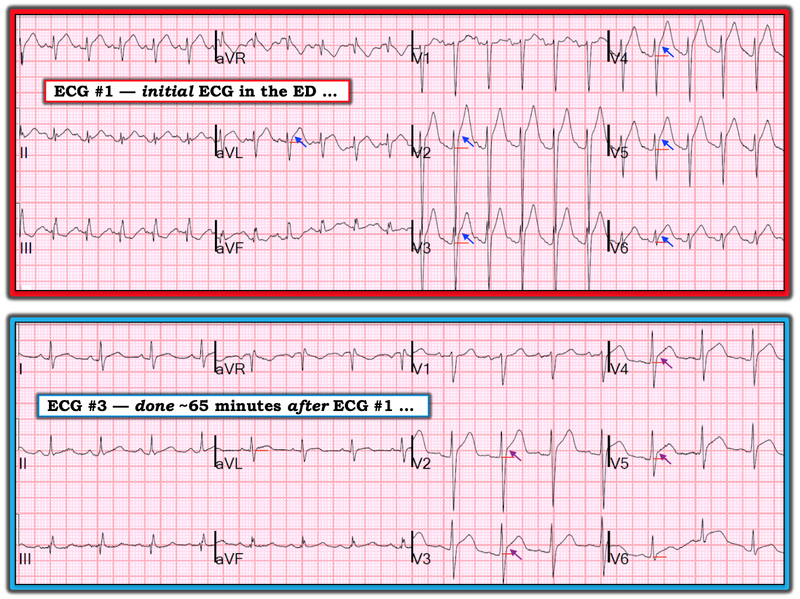 Figure-1: The 1st and 3rd ECGs in this case (See text). Discussion of Figure-1: As per Dr. Smith — ECG #1 showed marked sinus tachycardia at ~140/minute — with diffuse ST segment elevation. I often find it difficult to determine the precise amount of ST elevation when the heart rate is very fast. For clarity — I’ve added short horizontal RED lines in Figure-1 to show what I took as the “baseline” for assessing the amount of J-point ST elevation for the 2 ECGs in this figure. It may be especially difficult when there is marked tachycardia to identify the J-point that defines the number of millimeters of ST elevation. This is because of the tendency for the ST segment to be curved rather than showing a distinct J-point when the heart rate is fast. For clarity — I’ve added BLUE arrows in ECG #1 to show what I took as the J-point in various leads. I accept that others may differ with the location of my arrows. Suffice it to say that there appears to be ≥4-5 mm of ST elevation in leads V2-thru-V5, with a lesser amount of ST elevation in leads I, aVL, V1 and V6. Clinical Context is everything! Given the tachycardia + the lack of chest pain in this patient who was thought to have septicemia — I was not convinced that ECG #1 was the result of an acute cardiac event. Tachycardia may sometimes produce a surprising amount of ST elevation — that greatly decreases (or even goes away) when the heart rate slows. As per Dr. Smith — It is prudent to treat the other conditions, get the heart rate controlled — and then repeat the ECG! By the time ECG #3 was done — the patient’s condition had significantly improved, and his heart rate had decreased to ~90/minute (Figure-1). Note how at this slower rate — it becomes much easier to make out the change in slope within the ST segment that defines the J-point (PURPLE arrows). It should be clear that the amount of ST elevation is now significantly less. BOTTOM Line: It’s impossible to be certain how much of an effect the reduction in heart rate between ECG #1 and ECG #3 had in reducing the extent of ST elevation. We simply can’t tell if the degree of flow restriction produced by the myocardial bridge changed during the course of treatment — since many factors may influence to what extent myocardial briding obstructs flow (including disproportionate shortening of the period of diastolic ventricular filling that occurs at faster heart rates). Regardless, comparison of the 2 ECGs in Figure-1 highlights the wisdom of treating other conditions and, then repeating the ECG as the heart rate slows. Qualitatively — I thought the straight ST segment take-off in lead V6 of ECG #1 was the most suspicious shape suggesting more than just tachycardia was going on in the initial ECG. And as the heart rate slowed (in ECG #3) — the amount of persistent ST elevation with abnormal ST coving in leads aVL, V6 + the uncharacteristically straight ST segment take-offs in leads V3, V4, V5 all strongly favored an acute ongoing cardiac event. As per discussion above by Dr. Smith — other tests confirmed the diagnosis of myocardial bridging and Type 2 MI. Dear Dr Smith, great case as usual! I was wondering how you manage chest pain patients in the ED who present with ECG nr 5 in this case i.e. reperfused LAD pattern with residual j-point elevation. If they tell you they had chest pain a couple of hours ago but are now painfree with that ECG pattern, do you send them immediately to the cath lab, even at night? I'm usually scared there is a large thrombus and that they will re-occlude and therefore opt for primary-PCI in these patients when there is also residual j-point elevation, while those with Wellens pattern and no J-point elevation get DAPT and heparin/LMWH and cath during daytime if otherwise stable. I have however never seen a TIMI 0-1 flow in such a patient, but the residual ST-elevation is always disturbing to me. What is your approach? Best is cath lab immediately. Failing that, intensive antiplatelet and antithrombotic therapy (DAPT) and 12-lead ST segment monitoring to be certain there is no re-occlusion!